Growing up, the only boiled eggs I knew about were the hard-boiled eggs that sat, untouched, on our Seder plate at Passover, or the ones my mom baked into the center of the occasional meatloaf. And the only reason I knew there was something called soft-boiled eggs was because of a book I loved as a kid called Bread and Jam for Frances, about a badger who was a very picky eater. I didn’t hate boiled eggs like Frances, but I never thought much of them, either—they seemed mostly decorative. Eggs, it was clear, were only for breakfast, and they were for scrambling or for frying. During college and graduate school I often found myself having breakfast for dinner—or, sometimes, breakfast for breakfast and breakfast for dinner—because eggs are a great, cheap protein. Then, six or seven years ago, I noticed fried eggs appearing atop trendy burgers and pizza, and all of a sudden I realized that eggs had a place outside of breakfast. A delicious revelation? Totally. 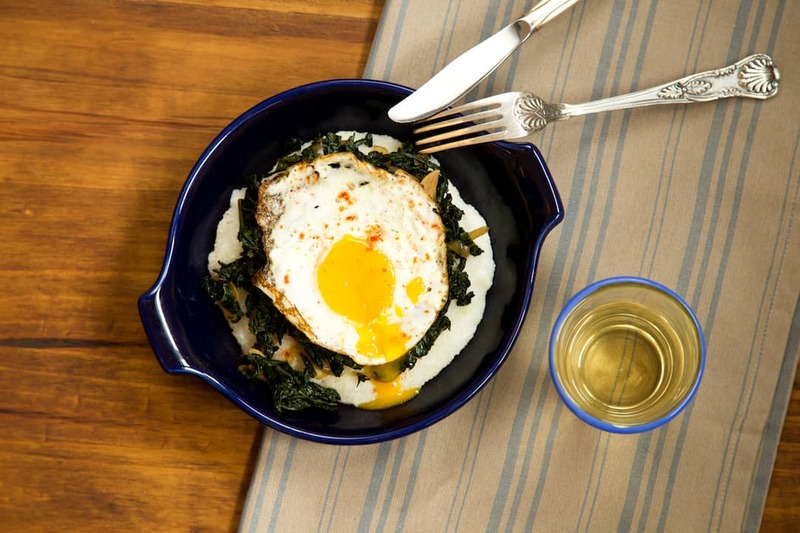 The yolk of a fried egg adds a perfect velvety moisture and richness to everything it touches. 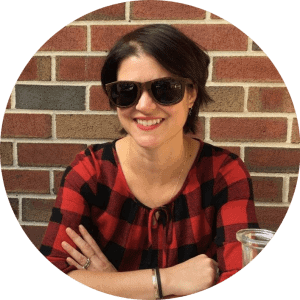 But in the past few years, I’ve been adding that same lushness to dishes with boiled eggs—medium-boiled eggs, to be exact, with their creamy, liquidy yolks. I still have a place in my heart for the crispy edges and buttery palate of a fried egg, but I am now a full-on boiled egg addict. Before we talk munchies, here’s the boiling breakdown for soft-, medium-, and hard-boiled eggs. This will vary slightly, depending on the age of your eggs, the number you’re boiling at once, and the the heat of your stovetop. You can split the difference between any of these, too, to suit your egg to the dish you’re using it in. Cool your eggs in an ice bath for a minute after boiling to make them easier to handle. 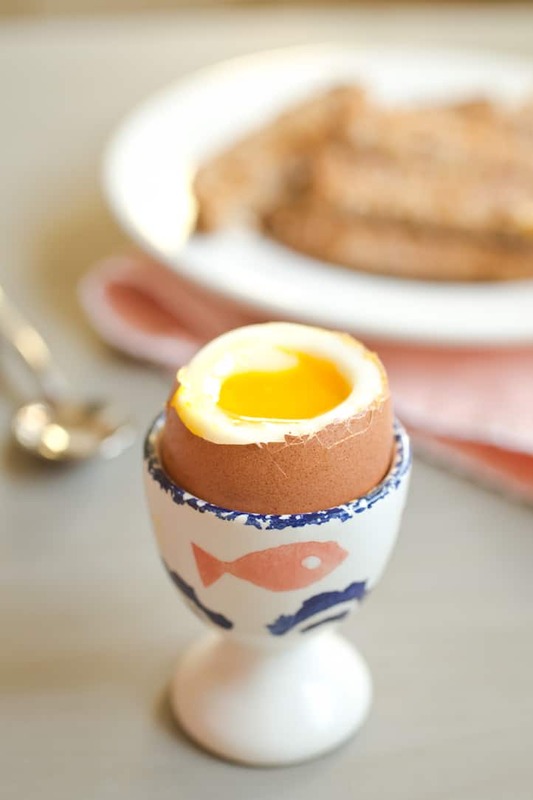 Soft-boiled eggs (that you crack and eat with a spoon for breakfast) have a soft white and a runny yolk. Boil for three minutes. Medium-boiled eggs (my favorite for everything) have a solid white and medium-runny yolk that’s a bright, beautiful yellow. Boil for six minutes. Hard-boiled eggs (still good, but don’t add moisture to a dish) have a solid white and a solid yolk that’s light yellow and crumbly. Boil for nine minutes. Here are some of my favorite ways to use boiled eggs; I’m sure you’ll find your own favorites once you start eggsperimenting. Remember to add salt and pepper to your eggs to taste. Raw veggie salads like this shaved Brussels sprout salad are delicious with a hard-boiled egg crumbled into them, or a medium-boiled egg mashed up to bind the veggies together. For a more substantial salad, hard- or medium-boiled eggs would go beautifully on top of my favorite Mediterranean tuna salad, too. 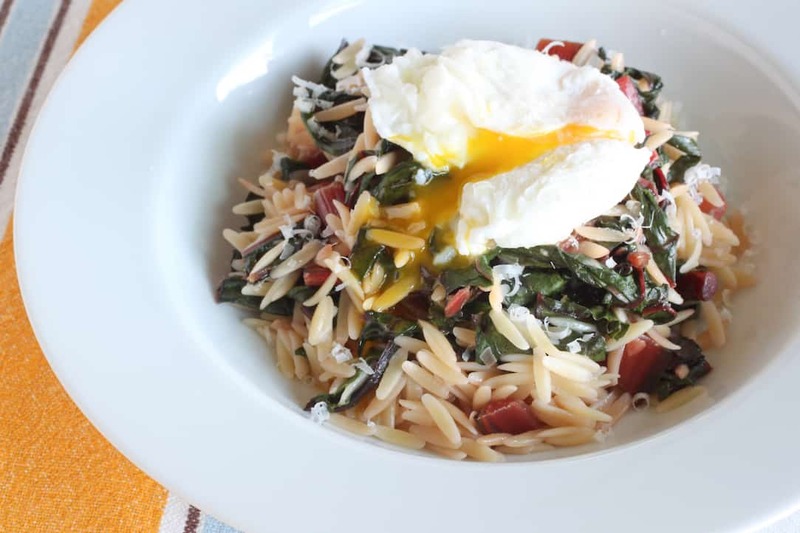 I love spaghetti carbonara, but now that it’s spring, how about going for something a little lighter? Prepare your pasta (I like shells since they cup the ingredients) and add, warm, to a pan with oil, butter, or cream and finely grated Romano cheese. 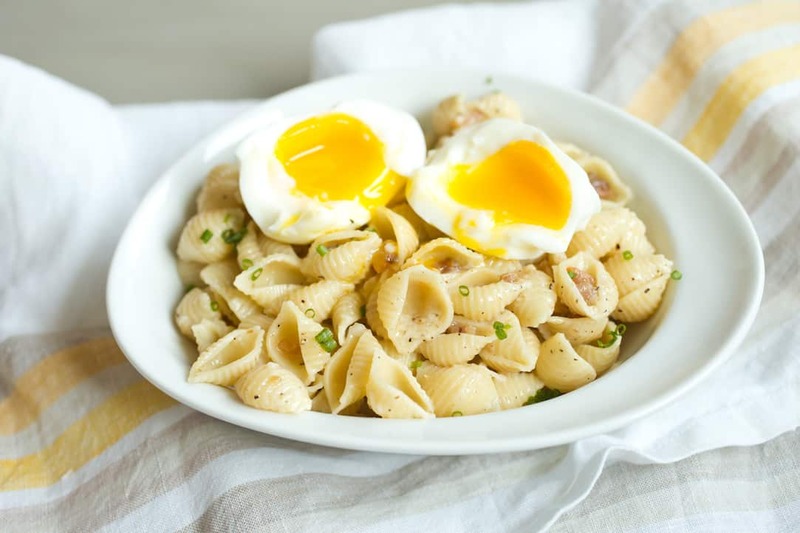 Add crumbled bacon and chopped medium-boiled eggs to the warm pasta and top with fresh chives for a meal that could double for dinner or a picnic pasta salad. One of my favorite meals is a big bowl of roasted vegetables: carrots, cauliflower, cabbage, broccoli—I love them all. Try this coconut oil-roasted broccoli recipe or sub in your preferred vegetable.Cut wedges of medium-boiled egg and mix with the hot veggies for a meal that’s flavorful and filling. Feeling extra fancy? Make an easy tzatziki sauce to drizzle over the top (mix Greek yogurt with a minced clove of garlic, half a minced cucumber, a squeeze of lemon juice, some salt, and fresh mint, if you have it) and add some pistachios. 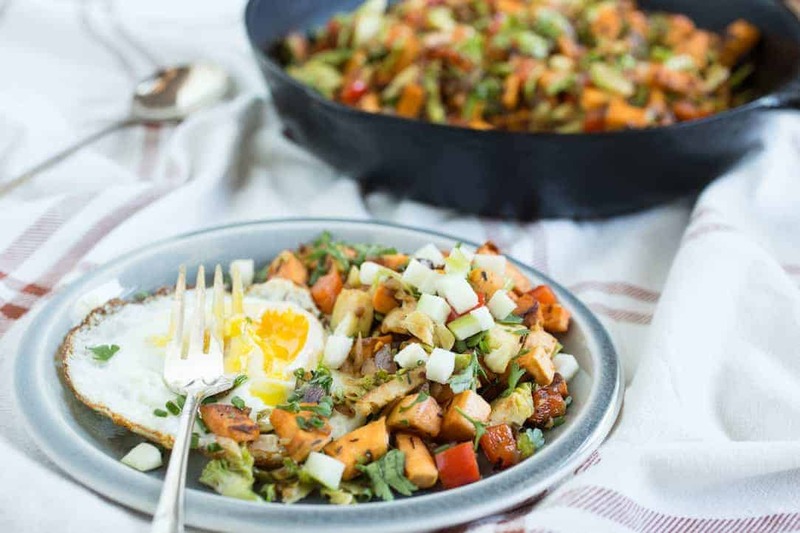 We love hash for breakfast, so why not for dinner? Dice a sweet potato and pan fry in olive oil with a little chopped onion and garlic. Chop any leftover veggies or meats from your fridge and throw them in, then top the whole thing with medium-boiled eggs. When cut open, the liquid yolk will coat the potatoes, veggies, and meat, binding the whole dish together. Boil lentils (1 part lentils : 3 parts liquid) until tender but not mushy (I like black lentils because they hold up well while boiling). Remove from heat, drain any excess liquid, and stir in a few tablespoons of olive oil and apple cider vinegar. Let the warm lentils soak up the oil and vinegar for 15-20 minutes, then add salt and pepper to taste. You can mix your lentils with roasted veggies (prepared as above) or eat them on their own. Either way, cut a medium-boiled egg or two into your bowl to add a beautiful creaminess to the lentils’ rich, earthy flavor.